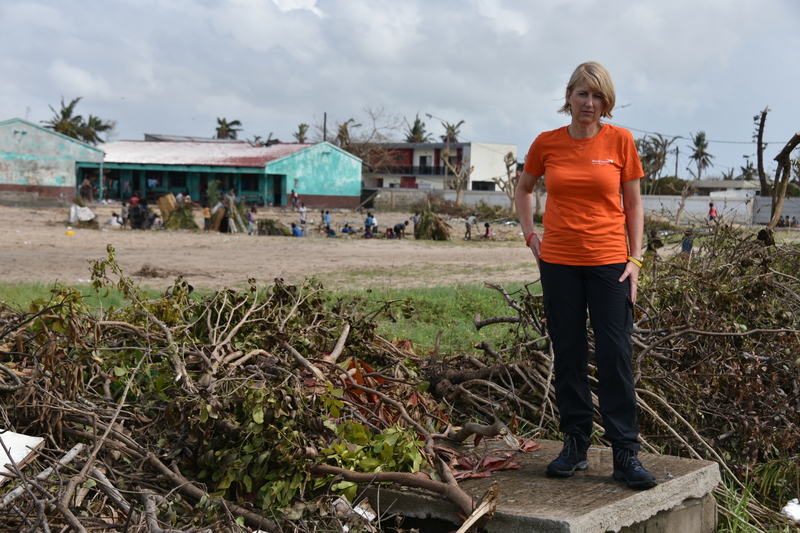 WV Australia CEO Claire Rogers surveys the damage caused by Cyclone Idai in Beira, Mozambique. Many families have been forced to flee their homes, around 35 families are now living in this damaged school (Image Credit: World Vision Australia). The clean up has started but it is going to take months to fix the health centres, hospitals and schools that have been torn apart and where children and their families now live in the husks of what is left. The picture outside of Mozambique’s fourth largest city of 520,000 citizens is less clear. The international agencies working out of a hall in the city’s airport are still trying to piece together what on earth has happened to the hundreds of thousands of people who live in the villages and rural areas in outlying areas that are impossible to reach by anything but helicopters. All day you can hear the clatter of choppers leaving on missions out to villages carrying packs of high-energy biscuits to families in flooded and broken settlements who have so far received nothing some ten days after Cyclone Idai struck only to be followed by a deluge of rain that flooded the low lying plains. The biggest challenge right now is to be able to scale up and distribute emergency assistance now that the period of helicopter search and rescue is coming to an end. At least 1,000 people have so far been rescued by helicopter. Those that remain in their villages want to stay and are doing things like trying to dry their grain on their rooftops and waiting for the flood waters to go down. Two days ago the water was as much as 11m high in some rural areas. In this kind of situation children are hugely at risk from drowning. No one is clear how many have died in these remote locations where 52% of citizens in Mozambique are children. The water is going down but there still remains a risk of rains in neighbouring Zimbabwe running down into Mozambique and of flooded reservoirs being forced to dump water that will only swamp the villages below once again. The city and the nearby rural districts are on a knife edge praying there will be no more heavy rains. The region is saturated so any more will immediately lead to flood waters going back up. Satellite images show some 2,165 km squared of the region is flooded with more than one million people affected. There are an estimated 65,000 people who fled the countryside now living in displacement settlements in urban areas in and around Beira. Frustration is growing as aid agencies battle to bring in cargo planes into a domestic airport that is now a hub that barely has enough electricity to keep a few lights on. Ships from the capital are also making the two day journey to bring in aid from the capital Maputo. Food deliveries of high-energy biscuits are only now starting to go out on helicopters but this is a very inefficient and expensive way to deliver aid since helicopter flights cost some $5,000 per hour and they can only carry small amounts. The roads are still broken and flooded meaning a very large area affected by floods is totally inaccessible except by air and small boats. There are a number of separated children who have fled their flooded homes. They have either been arriving alone or coming into urban areas with their elderly relatives. These are being registered by the UN. The risks to orphaned and separated children are very great and it’s crucial that we ensure these children are found and given the kind of protective care that is essential. Organisations like World Vision are experts in this filed and will be setting up child friendly spaces as soon as is possible. It is essential to get vulnerable children into an environment where they are monitored during the day and given a safe space to play and be with friends under the watchful eye of community members who are trusted and registered with World Vision. The government has told INGOs that it is deeply concerned at the possibility of an emerging health crisis brought about by the appalling sanitary conditions across the region. The bore wells are flooded, human waste is present in the flood waters and with so much water sitting around it is only a matter of time before mosquito breeding spikes bringing with it malaria which is already endemic in the area. Water-borne diseases such as cholera, typhoid and watery diarrhoea are all potential killers for children. With the health centers and hospitals damaged it is entirely possible that we could see is a second humanitarian catastrophe of sickness and death. It is imperative that agencies quickly improve sanitation, get people clean water and improve the hygiene situation. Children are especially vulnerable to these kinds of killers. The phasing of the crisis is largely built around the rescue, then feed, water and shelter survivors before moving onto rebuilding the health and education systems. At the moment thousands of people are living in health centres and schools. This cyclone and flooding crisis has affected an area that has already had to contend with earlier droughts and a flood that immediately preceded the cyclone. People are extremely poor with very poor diets and with a recent history of crop and livelihood destruction. These floods have now destroyed the crops that they were hoping were going to break this cycle. So over the next few months people are going to need food assistance and help rebuilding their lives, replanting crops and rebuilding their homes. As so often happens for people who are the very poorest one crisis comes on top of another crisis pushes the very poorest into absolute poverty and breaks any chance they have of escaping it. In these circumstances children are so very vulnerable. Their parents will be wanting them to work to bring in extra money, girls will be at risk of sexual exploitation or being sent into vulnerable domestic work, and with the schools and classrooms destroyed by the cyclone there is nothing to draw them back into education, which for many of them is one way to escape poverty. This is why it is so important for us to scale up our emergency response immediately and help those caught up in a regional crisis that has affected not just Mozambique but Zimbabwe and Malawi too.